Dr. Mezban completed her residency in diagnostic radiology at The Johns Hopkins Hospital. She also completed a fellowship at The Johns Hopkins Hospital in breast imaging where she was trained in digital mammography and conducted interventional breast procedures such as ultrasound guided cyst aspiration, ultrasound guided biopsy, sterotactic guided biopsy and pre-operative needle localizations. Following her training, Dr. Mezban was on the faculty at The Johns Hopkins School of Medicine and a specialist in breast imaging at the Avon Foundation Breast Center at The Johns Hopkins Hospital. Dr. Mezban is Board Certified by the American Board of Radiology and joined Northern Virginia Radiology Consultants in July of 2010 where she is practicing breast imaging in our nationally accredited breast health center. 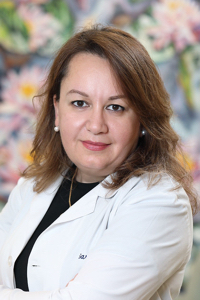 Dr. Mezban is an advocate of the multi-disciplinary approach to breast cancer treatment and in addition to her daily work with mammograms, breast ultrasound and MRI, she performs several types of minimally invasive breast biopsies including MRI guided breast biopsies. Dr. Mezban is keen in discussing biopsy results directly with her patients and cherishes a compassionate patient-doctor relationship.